The characters get more developed. There is mystery to uncover and there are some great battles. One action scene is particularly memorable, though it unbalances the flow of the book some by appearing midway through and overshadowing the ending. But then the ending isn’t this books strongest point anyway. I’m starting to notice that Butcher follows the simple but effective premise to subject your characters to as much punishment as possible. Believe me, Dresden gets his fill. This brings to mind the quote (not sure from whom) of how to do the Three Act Format. You’ve seen it elsewhere no doubt, but it makes me chuckle: Act 1: send your characters up a tree; Act 2: throw rocks at them; Act 3: chop the tree down. If you haven’t read the first book in the series, I’d start there first. Read my review of Storm Front here. For everyone else what did you think? 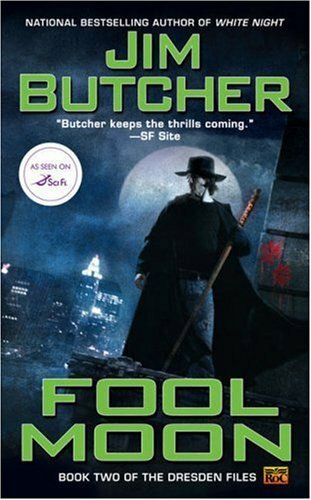 I hear that Butcher more or less started the urban fantasy genre. Does that mean we should "thank" him for Twilight? No, no. Don’t hurt the man. He seems nice. Glad you're getting into these books. I love em. Dresden goes through hell. A lot. Yep, they're fun. He has a good narrative. What did you think of the PD scene? That was intense. I tell you what - that was a pretty intense scene and over all, a pretty intense book. I enjoyed the way he handled the various wolf forms. There is a similar scene, just as intense, in 'Changes', that takes place in the PD. I won't spoil anything for you, but reading it made me think of Fool Moon. The FBI bit was genius. I think they did an episode of the TV show that drew from that part of the story.